Farmers can learn more about the benefits, costs and risks associated with forage shrubs and what varieties best suit soils and climate at a SWCC workshop in Woodanilling on 16 April. Keynote speaker and animal research scientist Dr Dean Revell will share insights into his Eureka Prize-winning ‘Enrich’ project for CSIRO, examining the value of perennial shrubs as livestock forage, the timing of its availability, livestock grazing behavior and diet selection, as well as the natural resource benefits associated with the inclusion of perennial shrub species. Dr Revell has more than 25 years of collective experience at CSIRO, the University of Western Australia, Massey University and the University of Adelaide in agriculture and natural resource management. His current focus is working with landholders to capture carbon farming opportunities. He said there were multiple benefits from looking at the whole farm system rather than just the areas where perennial shrubs were planted. “Adding forage shrubs into the mix of vegetation grown on farms can reduce risk in a variable climate, fill feed gaps, allow capitalisation on plant compounds to improve livestock health, contribute to integrated past management and reservoirs for beneficial insects, and improve the management of natural resources such as reducing soil loss and maintaining soil moisture. “A range of plants provide nutrients over time as conditions change. A diversity in the mix can stimulate the appetite and feed intake of livestock, boosting their performance. “There are also benefits in time and costs by providing feed during the autumn to winter period whilst enabling other parts of the farm to be rested,” Dr Revell explained. 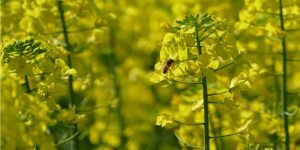 Farmers can also learn more at the workshop about the latest research into boosting canola production through pollination, thanks to a new SWCC project called ‘Managing vegetation on farm targeting pollinators and farm resilience’. SWCC scientist Dr Mike Christensen said research in WA had shown that bees can increase canola pollination by up to 30 per cent. A certified environmental practitioner and environmental auditor, Dr Christensen has more than 30 years of professional experience in community-based natural resource management and community development across the globe. Natural resources economist and fellow speaker John Karasinski said the role of honey bee pollinators to increasing the yield of the canola crop should not be ignored. Mr Karasinski will discuss the economic importance of honey bees for the Western Australian canola Industry and share his current research interests in honey bee pollinators and non-honey bee insect pollinators in Australia and estimating the size of the global population of managed honey bees. To register for the free workshop, contact Wendy Wilkins via [email protected] or phone 0448 939 307. This event is supported by SWCC through funding from the Australian Government’s National Landcare Program.